Can't get easier and quicker than this! This is a winner soup for the whole family. My kids prefer a soup that is smooth and simple with no pieces... and of course tasty! Just try this recipe once and you'll fall in love, guaranteed. If you are a potato lover, you'll realize how just a few ingredients can create such a big gourmet soup. Less is definitely more in this case:) and the simplicity is what makes this soup amazing! Soak 2 cups of black beans in water overnight. Next, cook the beans in salty water until tender and drain. In a cast iron pot add olive oil, and onions. Sauté for couple of minutes then add garlic. Let it sweat and incorporate, and add potatoes, salt pepper. Sauté for couple of more minutes, add water, bring to a boil. Lower the heat and let it cook until the potatoes are completely softened. Take a hand blender and blend the soup until creamy and smooth. Add some more olive oil if you wish. 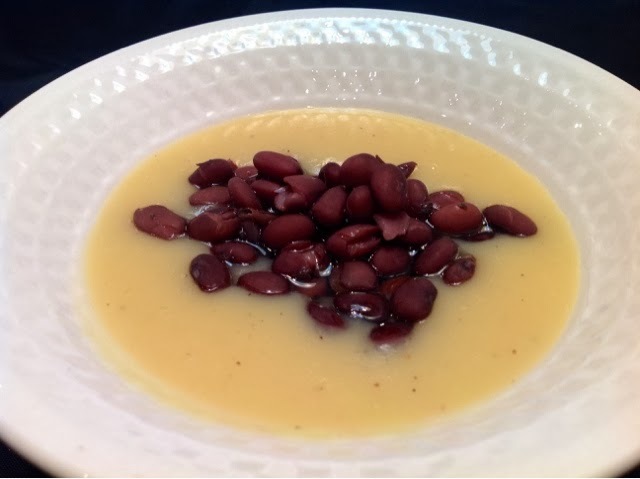 Top with black beans and serve.